Ultimate Fighting Championship (UFC) president Dana White isn’t happy with the conclusion of UFC 229. On a night that delivered in every way imaginable, the main takeaway for most will be the post-main event brawl. UFC lightweight champion Khabib Nurmagomedov had a stellar performance against Conor McGregor, submitting him in the fourth round. 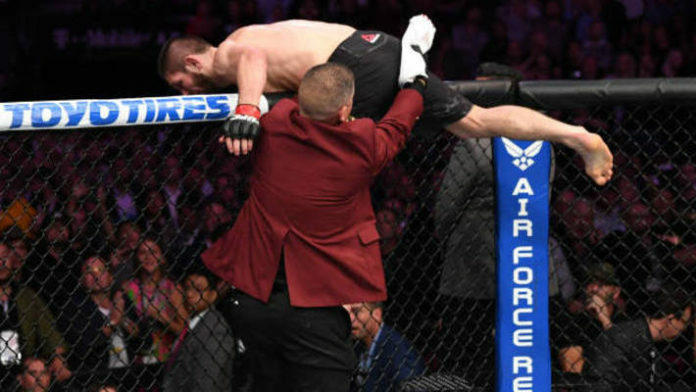 After the bout, Nurmagomedov hopped over the fence and attacked Dillon Danis in the crowd. Members of Nurmagomedov’s team then brawled with McGregor inside the Octagon. Islam Makhachev and Zubaira Tukhugov are two of the three members of Nurmagomedov’s team who many believe were the ones arrested. White made it clear that if anyone involved in the brawl were UFC fighters, they’d be released. Tukhugov is scheduled to take on Artem Lobov at UFC Moncton on Oct. 27. Do you think anything could’ve been done on the UFC’s part to prevent the brawl last night?